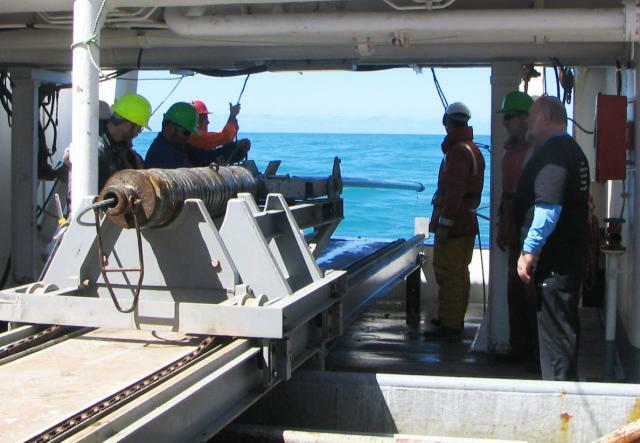 Deployment of a piston core sampling device used to collect long sediment sample cores during an autumn 2006 cruise onboard NIWA vessel Tangaroa. Like a gravity corer, the piston core device comprises a long metal pipe to collect sediment samples, and a weighted head. In the picture, the pipe is seen extending over the side of the ship. When the end of the corer reaches the seabed, a piston is fired which forces the metal pipe down into the sediment. Using this forced method, long sediment cores - some as long as 15m or 20m - can be recovered and brought back up to the ship. Giant and Jumbo versions of the device can extract even longer cores, an extreme example being the 54m core sampled from research vessel Marion Dufresne in 1990. Image courtesy of Clark Alexander, Skidaway Institute of Oceanography.